This new series for basketball lovers (ages ten and up) comes from former NBA star Kobe Bryant who created the idea and characters. Canadian author, Wesley King, did the writing and it’s a massive volume close to 600 pages. RAIN: The star player. He’s the one who makes it happen. His team is only there for support. TWIG: He comes from a better part of town. Some resent his presence. His father is demanding and always wants him to act like a man. CASH: He’s big and full of muscles. Home schooled and quiet. An incident in his past haunts who he is in the present and controls who he wants to be in the future. Peño: Older brother of Lab with less skills on the basketball court. Mom died three years ago and his dad works long hours. Peño does all the chores and cooks for the family. LAB: He can’t get over the sorrow of losing his Mama. He doesn’t understand how his older brother and dad have moved on from the loss. Basketball is his escape. The first 100 plus pages centers around Rain, the player Kobe Bryant most identifies with. He brings his A-game to the court and wishes his teammates would do the same. Everything changes at the beginning of a ten day summer training camp when a new coach arrives, Rolabi Wizenard. Rolabi is a wizard and his training methods are magical and scary for the players. Professor Wizenard can communicate with Rain through thoughts. He also turns the run down gym into a castle where the team must defend a trophy, a crumbling mountain range where death is certain unless they make a shot, and several sense altering techniques. Throw in a real tiger who is obviously a great defender and you have the makings of the weirdest but also the most life altering camp. Rain eventually sees that basketball is a team sport and fear drives most to fail. The next point of view is from Twig. I expected the story to continue right where Rain left off. Not so fast. Twig’s pages go back to the beginning of training camp and readers discover how he reacts to the training methods. And so we get five books in one detailing how each player survives the camp and prepares for the upcoming season. This unusual story telling technique may bog down some, especially those not into basketball. But for the millions of basketball loving boys, ones who are always sure they will play in the big leagues, this series will be their own training camp of what it takes to succeed. I can see a coach using the Wizenard Proverbs in their own practices. They could even assign one of the five stories for a player to read who is closest to the person they are becoming. Free of inappropriate language or teen romance, this is about life, basketball, and the fears that hold us back. Kobe Bryant turns pieces of his basketball journey (and magic) into teen book. I received an ARC for my my honest review. This July marks the 50th anniversary of the historic first walk on the moon by Neil Armstrong and Buzz Aldrin. Staying back in the command module was the third astronaut, Michael Collins. What better way to educate a young generation born in this century with these two titles from Sleeping Bear Press. THE FIRST MEN WHO WENT TO THE MOON is an illustrated look at the mission from blastoff to the splashdown celebrating their return to Earth. The drawings are colorful and bold, accompanied by text in verse and 3-5 lines of informational text. The final two pages display a half dozen photos with a more detailed description of Where are Eagle and Columbia now? and More About the Mission and the Moon. This would be a great starter book for any young reader who knows little about this time in history. It will leave in them a reality of how great this accomplishment turned out. MARTY’S MISSION is fictionalized account of a real event that occurred as the astronauts were returning to Earth. A ten-year-old boy plays an important role to ensure their safe return. Marty’s family live on Guam where his father manages the NASA Tracking Station. During the final hours of Apollo 11’s mission something goes wrong with the station’s antenna. It’s up to Marty to make the necessary adjustment so that communication can be restored to bring the craft home. The tale is told atop full panels of beautifully drawn colored pictures. It’s a compelling story with the excitement of the time transferred to readers. The Author’s Note concludes the book with a look back at the whys and hows of the mission. Both of the books are perfect to share in the classroom or to surprise your own budding astronaut with copies of their own. The moon walk’s fiftieth anniversary (July 2O, 2019) would be a perfect time to unwrap these gifts. No fools here on on this fun-filled edition of MMGM—just links to great reviews and features. I share a few thoughts on Mr. Penguin and The Lost Treasure by Alex T. Smith. Click the smiley to reach my post and do the same for everyone else below. June McCrary Jacobs at ‘Reading, Writing, & Stitch-Metic’ has a fun historical fiction MG picture book, ‘Papa’s Mechanical Fish’, by Candace Fleming. Sue Heavenrich at Sally’s Bookshelf also has a fun MG read….Garbage Island, written & illustrated by Fred Koehler. Maria Antonia at Of Books, Photography, and Tea has some mini-reviews for a Middle-Grade reading bingo challenge. No foolin’! Suzanne Warr at Tales from the Raven spotlights The Tail of Emily Windsnap, by Liz Kessler, and comes with a non-book-related but timely personal announcement that connects to the book. Completely Full Bookshelf recommends Wundersmith: The Calling of Morrigan Crow by Jessica Townsend. Monday is also the last day to enter the Spring Signed Book Giveaway! Patricia Tilton at Children’s Books Heal reviews The Lost Girl by Anne Ursu about identical twins who are separated at school. Beth Mitchell at Imaginary Friends has a review of The Not-So-Boring Letters of Private Nobody by Matthew Landis. Dorine White at The Write Path has a spotlight and Giveaway of the Hello There! Trilogy by Laurie B. Arnold. Alex Baugh at Randomly Reading is back with another fine review. Today she features Where the Heart Is by Jo Knowles. Rosi Hollinbeck reviews HEARTWOOD HOTEL: HOME AGAIN by Kallie George Rosi also has some not to be missed links for her writing friends. Janet Smart at Creative Writing in the Blackberry Patch is featuring The Mostly True Adventures of Homer P. Figg by Rodman Philbrick. Michael Gettel-Gilmartin, The Middle Grade Mafioso, is featuring Mike Lupica’s NO SLAM DUNK. 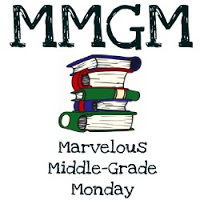 Karen Yingling at Ms. Yingling Reads has another informative MMGM post. Be sure to check out today’s feature and all of her reviews the past week including The True History of Lyndie B. Hawkins. The transition to middle grade books can be a harsh one for many young readers. One day they’re happily going through their 100 page chapter book and then the inevitable happens—they’re assigned to read an award winning middle grade novel with 300 plus pages. Some survive, but others get more and more turned off as to what lies ahead. The solution is simple. Find transition type MG books with exciting plots that are easy to read. MR. PENGUIN AND THE LOST TREASURE is just what the teacher (or parent) ordered. At just over 200 pages, this fun adventure features Mr. Penguin and a spider named Colin. Mr. Penguin longs for an adventure and he gets exactly what he wants when Boudica Bones calls, owner of the Museum of Extraordinary Objects. There’s a treasure hidden in the museum and she needs help finding it. Off they go for one surprise after another as they journey deep below the museum floors. Illustrations and a not always white background for the text, add to the mystery and fun. Yes, it’s a silly romp but it had me smiling and the targeted audience will smile even more. This is the first in a series of adventures with Mr. Penguin. The descriptions will have your head full of visuals from the situations the adventurers get into. What an appealing layout! The book begs to be picked up and thumbed through. Will appeal to both girl and boy emerging readers. The whimsical pictures will make you wish you had a set to decorate a child’s bedroom. There are more complex sentences than you’ll find in a straight chapter book. These will challenge and provide the proper step so that in years to come a child is ready to delve into longer and more intricate plots. After considering several career options (space traveler, cake maker, professional rabbit) and working as a production assistant for an outdoor theatre events company, Alex decided to train to do the job he’d wanted to do since he was five – an illustrator specialising in the world of children’s publishing. Alex graduated with a 1st Class Hons degree in Illustration in 2006 and having won second place in the Macmillan Prize for Children’s Picture Book Illustration in his final year, Alex begin working on his first commission as he put his degree show up! Since then Alex has gone on to work for a wide variety of clients not just in the publishing industry, as well as writing and illustrating his own picture books, many of which have won prizes and have been read on TV during the Bedtime Hour on the CBeebies channel. Alex is also the creator of the CLAUDE fiction series for early readers. The first title,CLAUDE in the City was selected for the Richard and Judy Children’s Book Club 2011 and was shortlisted for the Waterstones Children’s Book Prize in 2012. The first three books in the series are now published in fourteen languages across the world and a further three books will be hitting the shelves from October 2012. When not working Alex enjoys doodling in his sketchbook, reading, people watching and eavesdropping. He is also a big fan of cake and a nice cup of tea. He lives with and under the constant ‘supervision’ of his canine companions – two very tiny, very naughty chihuahuas (Coco and Mr. Bongo) and an ancient and very bossy Yorkshire Terrier – Lucy Locket. I received an ARC in exchange for my honest review. I was fortunate to win a copy of this book on Literary Rambles awhile back. If you’re not familiar with Natalie Aguirre’s site, it is filled with great author and agent interviews and frequent giveaways. Take a look after reading my feedback on THE MAGIC OF MELWICK ORCHARD. T his tender tale is about girlhood, friendships, and a magical tree. It centers around the tough struggles of a family dealing with the realities of their youngest, Junie, who has cancer. Her older sister, Isa, narrates the story with heart tugging reality. The attention given to Junie, makes Isa feel invisible. She longs for everything to return to normal, but Junie’s hospital stays gets longer and bills pile higher. Her mother’s depression also is a concern as is her father who seemingly forgets his daughter in more ways than one. The abandoned orchard behind their house give Isa hope in the form of a unique tree. It sprouts magic and maybe it might help their family. The magic doesn’t overtake the story but provides a nice backdrop for the troubles that beset Isa and her family. She loves her sister and hasn’t let anyone else into her life until a new friendship slowly sprouts from a rather exuberant girl. Although a bit long for emerging MG readers at 360+ pages and a bit sad, the ending is satisfying and wraps up all the plot points. Those who love realistic stories with a touch of magic will be hard pressed to find a better one. After more moves than they can count, Isa’s family finally puts down roots. People in town are afraid of the abandoned orchard behind their home, but Isa and her sister Junie are happy to have acres of land to explore. But when Junie gets sick, Isa’s mom falls into a depression, and medical bills force Isa’s dad to work more. No one notices that Isa’s clothes are falling apart and her stomach is empty. Out of frustration, Isa buries her out-grown sneakers in the orchard. The next day a sapling sprouts buds that bloom to reveal new shoes. Can Isa use this magical tree to save her family? Rebecca is also a classically trained ballet dancer, and continues to teach creative movement and storytelling to young students. You only have two days left to enter National Geographic’s huge giveaway to launch the second book in the Explorer Academy Series. ALWAYS in the MIDDLE and four other blogs hosted the tour last week. A separate Rafflecopter entry form is being used for each site so a total of five winners will win all the great items pictured below. Here’s my post with all the details or head right over to the Rafflecopter entry form to sign up. I have a review of THE LAST LAST-DAY-OF-SUMMER by Lamar Giles. Click the ball to reach my post and do the same for each of the features and reviews below. Joanne R. Fritz at My Brain on Books has a review of THE BRIDGE HOME by Padma Venkatraman. June McCrary Jacobs at ‘Reading, Writing, & Stitch-Metic’ features a ‘Disney Ideas Book: More Than 100 Disney Crafts, Activities, and Games’. Maria Antonia at Of Books, Photography, and Tea has the graphic novel and Newbery Honor book, El Deafo by Cecelia Bell. Completely Full Bookshelf returns to our MMGM family this week with a giveaway of 5 signed books from the North Texas Teen Book Festival and a great post about the experience of being at the festival. Patricia Tilton at Children’s Books Heal reviews A Case for Buffy (Detective Gordon Series) by Ulf Nilsson, a heartwarming animal detective adventure. Rosi Hollinbeck reviews The Truth About Martians by Melissa Savage. Rosi also has some not to be missed links for her writing friends. Dorine White at The Write Path spotlights the book Captain Green and the Plastic Scene. Susan Uhlig loves the historical mg Skylark and Wallcreeper by Anne O’Brien Carelli. Beth Mitchell at Imaginary Friends has a review of The Remarkable Journey of Coyote Sunrise by Dan Gemeinhart. Janet Smart at Creative Writing In The Blackberry Patch blogs today about The Littlest Bigfoot. Karen Yingling at Ms. Yingling Reads has another informative MMGM post. Be sure to check out today’s feature and all of her reviews the past week. WELCOME TO ANOTHER MARVELOUS MIDDLE GRADE MONDAY! Start with a little Hardy Boys, add in a light dose of The Phantom Tollbooth, and sprinkle in a little Ghostbusters to top off the recipe. The result is a rollicking adventure with a pair of endearing cousins. Humor abounds as does a heartwarming story you’ll want to share. Otto and Sheed Alston are legendary in their Logan County, Virginia community. These budding sleuths have solved some pretty wild and wacky cases. They long for one more adventure on the last day of summer break (and another key to the city), but never expect to find the whole town unable to move in some sort of time stoppage. Residents are stuck in their last position but can carry on a conversation. Otto and Sheed are unaffected, still able to move, and set out to unfreeze the town. Otto takes frequent notes, helping the two deduce what is going on. Depending on the situation, Sheed can either be laid back or jump in and get it done kind of guy. Filled with crazy characters and a touching bond between these two cousins, the story will appeal to both girls and boys. The third person narration stays close to the boys even when the evil doings keep them separated at times. The middle grade stage is ready for a pair of new heroes and what better ones than Otto and Sheed. Kids will attach themselves immediately to the feeling a last day of summer brings. Otto and Sheed will have them reading right to the first bell. Characters like Mr. Flux, AM, PM, Timestar, and Clock Watchers make sure surprising moments come at a fast pace throughout the 41 chapters. The less appealing side of time travel is presented when Otto finds out things about his own future and the ones he love. It might even bring a tear to your eye. Petey is a character a lot of boys and girls could emulate. Don’t be afraid to try something challenging and become the person you are meant to be. No issues of race here. That alone is refreshing. Lamar Giles is a well-published author and a founding member of We Need Diverse Books. Lamar has two novels forthcoming in 2019: his debut middle grade fantasy THE LAST LAST-DAY-OF-SUMMER (Versify / HMH) and his fourth YA thriller SPIN (Scholastic). Also a two-time Edgar Award finalist in the YA category, for his debut YA thriller FAKE ID (HarperCollins, 2014), and his second YA thriller, ENDANGERED (HarperCollins, 2015). His third YA thriller, OVERTURNED (Scholastic, 2017) received a glowing New York Times review, and was named a Kirkus Best Book of 2017. FAKE ID has been optioned by Sony Pictures. Lamar is a contributor to the YA anthology THREE SIDES OF A HEART (HarperCollins, 2017), the editor of the We Need Diverse Books YA short story anthology FRESH INK (Random House 2018), a contributor to the forthcoming YA anthology BLACK ENOUGH: STORIES OF BEING YOUNG & BLACK IN AMERICA (HarperCollins / Balzer & Bray 2019), and a contributor to a forthcoming We Need Diverse Books middle grade anthology THE HERO NEXT DOOR (Random House 2019). He has published several short stories for adults. You only have six days left to enter National Geographic’s huge giveaway to launch the second book in the Explorer Academy Series. ALWAYS in the MIDDLE and four other blogs hosted the tour last week. A separate Rafflecopter entry form is being used for each site so a total of five winners will win all the great items pictured below. Here’s my post with all the details or head right over to the Rafflecopter entry form to sign up.